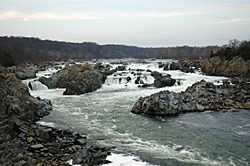 The Great Falls are a series of cascades and rapids on a 2/3 mile stretch of the Potomac River known as Mather Gorge. The total drop over that stretch is around 76 feet, although no single drop exceeds 20 ft. There are great views of the falls from the Great Falls Tavern National Historic Park Visitors Center at Mile 14 on the C&O Canal Trail. Swallow Falls : Height - Two drops around 16 ft. There are four waterfalls in the Garrett State Forest. Swallow Falls and Muddy Creek Falls are the most spectacular. Swallow Falls runs along the wild and scenic Youghiogheny River before plunging over a bed of sandstone and shale. The upper and lower falls are located near the Nature Center and campground in Swallow Falls State Park. Mountain bike trails in the Garrett Trail System run between Herrington Manor State Park and Swallow Falls State Park. Approximately one mile from the Swallow Falls State Park trail head, the trail crosses a stream. In high water periods, it is hazardous and crossing may not be possible. This is the highest free-falling waterfall in Maryland. The falls plummet over cross-bedded sandstone and shale. It is located on Muddy Creek in Swallow Falls State Park. Swallow Falls is just a short distance away. Ohiopyle Falls : Height - 20 ft.
One of the most popular features of Ohiopyle State Park, these powerful falls drop about twenty feet along the Youghiogheny River. With increased water flow the falls are much wider in winter and spring. The most easily accessible viewing is from the Falls Day Use Area which is the central point for visitors. You can find a Visitors Center, parking, restrooms, gift shop/snack bar and overlook platform here. Mountain bikers on the Youghiogheny River Trail pass through the Day Use Area. 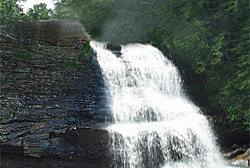 Cucumber Falls : Height - 30 ft. This beautiful bridal veil type waterfall on Cucumber Run can be reached by a short hike on the Meadow Run Trail. Parking is at a trailhead on SR 2019. By bike it is a short ride south of the Day Use Area along Rt.381 (to the intersection with SR 2019). Cascades Falls: This beautiful woodland waterfall in Meadow Run is near the park office. The cool, clean waters of this stream make it a favorite haunt of anglers. Jonathan Run Falls : Height - 15 ft.
Several falls can be seen from the Jonathan Run Trail. 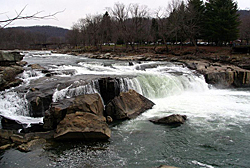 A short distance from where it intersects with the Youghiogheny River Trail is the largest falls along Jonathan Run. It drops over rocks between rhododendron-lined banks. The trailhead is along the Holland Hill Road. The trail crisscrosses Jonathan Run and passes by small waterfalls, including Jonathan Run Falls. The trail connects to the Great Allegheny Passage. 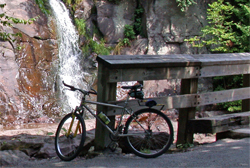 After mountain biking the McDade Recreation Trail, there are a dozen waterfalls to visit in the nearby area. Dingman's Falls : Height - 130 ft.
Silverthread Falls : Height - 80 ft.
One of the most popular falls in eastern PA, Dingman's Falls is likely to draw crowds during the summer, especially on weekends. The falls are easily accessed by a trail (no bikes) with boardwalk and bridges, leading through a ravine of Eastern Hemlock. Dingman's Creek plunges 130 ft. over stepped layers of shale to form these spectacular falls. Silverthread Falls is also accessible from the same trails. Water flowing through weak fractures in the shale helped to form 80 ft. Silverthread Falls. The Dingman's Falls Visitor Center, trailhead and parking are west of Rt. 209, just south of Dingman's Ferry where the toll bridge crosses the Delaware River into New Jersey. Bushkill Falls : Height - 130 ft. Bridal Veil Falls : Height - 25 ft. 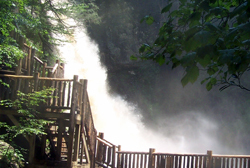 Known as the “Niagara of Pennsylvania” Bushkill Falls is a series of eight falls in the Pocono Mountains. Here, the waters of Bushkill Creek begin their descent to the Delaware River. A network of hiking trails and bridges lead to breathtaking views of the falls, including the 100 ft. high Main Falls, and surrounding forest. From the deep pool at the foot of the falls the creek continues to fall another 70 ft. through the gorge. Many different types of falls can be appreciated here such as Pennell, Bridal Veil and Bridesmaid Falls. 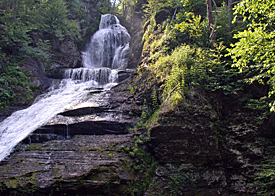 Bushkill Falls is privately owned. There is an admission charge and some very “touristy” facilities such as snack bar, ice cream parlor, various gift shops…you get the picture! Take exit 309 from I-80, north on Rt. 209 to Bushkill Falls Road. Bushkill Falls Road is only a few miles north of the Turn Farm trailhead for the McDade Trail. Take exit 309 from I-80, north on Rt. 209 to Bushkill Falls Road. Bushkill Falls Road is only a few miles north of the Turn Farm trailhead for the McDade Trail. Jim Thorpe Area Trails : Buttermilk Falls, Luke Falls, Hawk Falls | Jim Thorpe, PA | Pocono Region. Lehigh Gorge Trail: Buttermilk Falls, Luke Falls | Jim Thorpe, PA | Pocono Region. Buttermilk Falls and Luke Falls are beautiful cascading falls dropping into the Lehigh River from nearby streams. They are both in the Rockport Access Area of Lehigh Gorge State Park Trail and can be viewed directly from the trail. Luke Falls are just to the south of the access parking lot and Buttermilk Falls a short ride north. Hawk Falls: Height - 25 ft. Located in Hickory Run State Park, Hawk Run cascades over a series of ledges into a deep pool. The same glacial activity that created the well-known boulder field in the park is also responsible for the falls. A 3/4 mile hike on a moderately difficult trail leads to the falls. Other small falls are visible along the way. Hickory Run State Park is adjacent to the Lehigh Gorge Trail between Rockport and White Haven.